Starquest is the latest game to be released by Big Time Gaming. 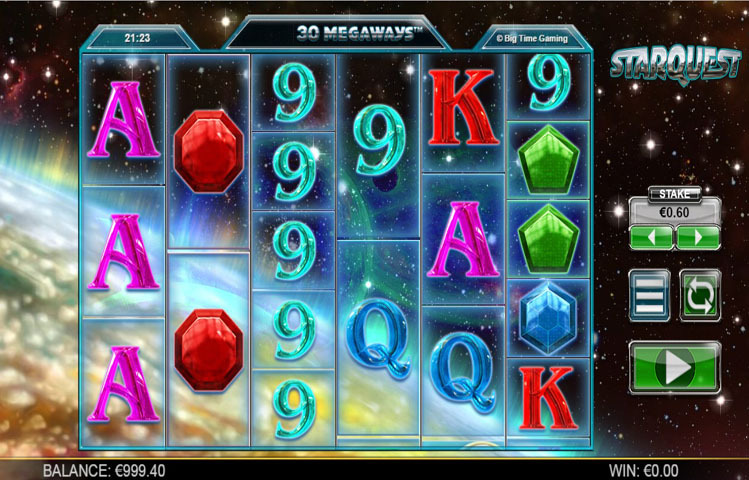 The new slot machine has got a lot to offer to players, staring from an exciting gaming journey that takes them to outer space, to great rewards and fortunes. Players will take a trip to outer space as they join the beautiful astronaut along the way. The game is entitled Starquest, this is why it makes sense that the players will be taken on a great adventure among the stars to unveil their quests. This is why players will see that the reels of the game are located in outer space. They will also see the stars across the screen and a mystical planet on the left. The game has a 5 reeled format that is home to 11649 ways to win. This great amount of ways to win is thanks to the format of the game as each reel can hold up to 7 symbols. The game is developed by Big Time Gaming, which is well known for its beautifully designed game. These games manage to provide players with an immersive ride that is like none other. The reel setup is located in outer space among the stars. Players will also see a glowing planet on the left side of the reels. As for the icons that are going to be appearing across the slot’s reels and its lines, they are also inspired by the theme of the game. This is why the main character of the game, the blonde astronaut is going to appear as a symbol on the reels of the game. The other icons appearing on the reels are inspired by classic slots as they include precious stones, diamonds and gems. There are also poker card icons that come in colorful designs. Starquest is not only a fun experience that offers players an immersive ride. This is because the game has a highly rewarding feature. This feature is the Wild Feature Expand and Re spin. The wild icon of the game is the blonde astronaut that will join players during the game play. The wild icon can expand to cover up to 5 positions on the same reel and that will also trigger a multiplier, which will appear on the wild icon. That is not all, as any wild expanding symbol appearing will trigger a re-spin. The multiplier that would appear on the wild icon varies between 1x and 5x. Also, when more wilds appear and expand, more re spins will be given to players. In addition, the multipliers from the different wild reels will be multiplied to result in the final multiplier for that round.